From 1956 to 1980, the results of the downhill, giant slalom and slalom at the Olympic Games counted also for the World Championships. The combined event which was not included in the Olympic medal tally was only considered as a world title. 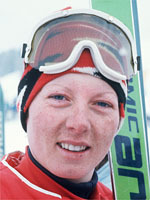 Annemarie Moser-Proll, who set a new women's record by winning the World Cup overall title six times during the 1970s, is widely accepted as the greatest woman downhill racer of all time. Like many Austrian youngsters brought up in the more remote, rural areas of the country, Annemarie went almost everywhere on skis during the winter and spent much of her youth humiliating the boys in downhill challenges. By the time she was 15 the Austrian prodigy had already decided she was ready to put the fun and games of the village behind her and in 1968 competed in her first world cup event. She fell heavily several times and finished last. Having digested the brutal reality of life in the rarefied atmosphere of the World Cup circus, Proll set about learning to dominate it. Within two years - and when she was still only 18 - she had won her first world cup overall title, the first of no less than five consecutive triumphs between 1971 and 1975. At the Sapporo Olympics in 1972 Proll found herself playing the bridesmaid to Swiss Marie-Therese Nadig in the downhill who came from nowhere to post a time the Austrian could not match. Silver was also the best she could manage in the giant slalom, and only gold in the combined event salvaged what was by her elevated standards an otherwise hugely disappointing games. The Austrian left Japan to massage her wounded pride. Despite her anguish at Sapporo she won gold at the world championships in St Moritz. In 1974 she married Herbert Moser and her career appeared to be back on course after yet another overall world cup victory in 1975. However, in 1976, shortly before the start of the Olympic Games in Innsbruck, she abruptly announced she was retiring from all competition. Just over a year later she was back, the cut-and-thrust of top-class downhill competition proving too great a challenge to resist. After two second places in World Cup competition in 1977 and 1978 she won her record sixth title in 1979. Then came her moment of personal redemption, the title she wanted most. At Lake Placid in 1980, Moser-Proll finally won an Olympic gold medal in the downhill, a full half second ahead of her tormentor at Sapporo, Marie-Therese Nadig. She then became a mother in 1982 and grandmother in 2003, after a career that saw her win 62 races including 36 downhills - both records.